Photolalia: Right Place, Right Time. -- Some images... and a few brief words about them. 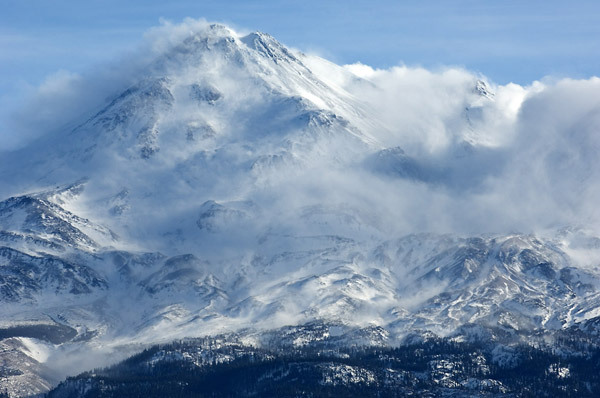 (Mt Shasta, Northern California, 2008. Image copyright Hamish Reid. Click image for larger version). Right place, right time: I really wasn't looking for yet another damn Mt Shasta shot, but in a weekend of miserable weather when Shasta was usually shrouded in cloud, this was a shot that I just couldn't resist, for what I think are obvious reasons. I could see what was coming as I was driving north (away from the mountain) on Interstate 5 towards Yreka, and I guessed I had maybe ten or fifteen minutes to get it before the clouds rolled back in. I had to get off the freeway in a hurry at the next exit, double back to the south, and drive as quickly as I could along old two-lane blacktops to where I knew the shot would look great (up towards Highway 97). I didn't have a tripod with me, so I did the shot hand-held with the Nikon 70-200mm VR lens on the D2X, in slowly-fading early-evening light and ferocious winds, standing on the side of the road just out of range of the occasional passing truck. All I'll say is the vibration reduction (VR) in this lens is a miracle  this image has been printed to 17x22 inches on my Epson 4800, and it's sharp and evocative even at that size. And yes, a few minutes later the clouds came back and I didn't see the mountain again the entire weekend; a few hours later I was driving across snow-covered roads and fighting a blizzard.